Last Christmas, in our quest for sophisticated toys that stimulate imagination, we bought Aubrey a Roominate building set. 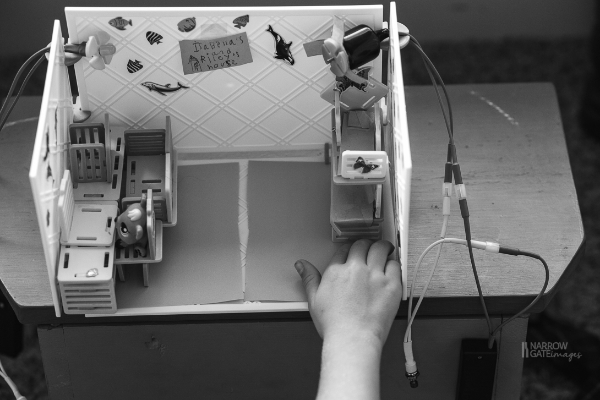 The Roominate sets consist of interlocking plastic pieces that are designed to be open-ended, allowing the child's imagination to take center-stage, as well several simple circuits and various electrical components that can be used to create all sorts of fun things (ceiling fans, a working washing machine, windmills, a circular saw, and more). 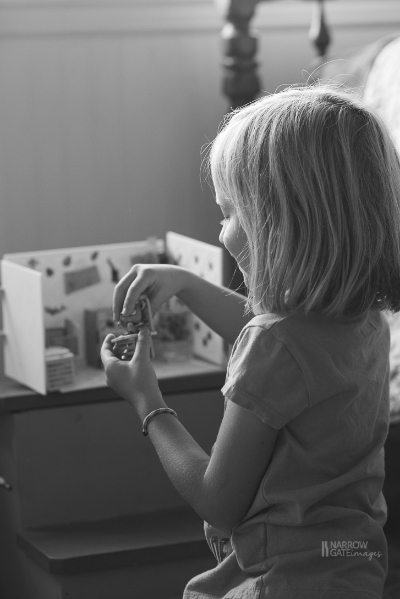 Although the toys are marketed to girls, they don't play to gender stereotypes and allow a girl to harness her brain while engaging in imaginative play. Aubrey loved her Roominate out of the gate, but then it moved its way to the back of the toy lineup, where it languished in a bin for about 6 months. Last week, however, Aubrey pulled it back out again and has enjoyed building a house for her Littlest Pet Shop puppies, complete with light and ceiling fan. She played for hours and was so proud of her final result. I was just happy she sat in a lovely pocket of light in her room to build--what can I say, I'm a photographer through-and-through.